International Woodworking Inc. (IWI) is highly skilled in producing and installing fine, custom architectural millwork specified for various applications and functions by architects and other design professionals. Our experienced staff of woodworking craftsmen, veneering experts, cabinetmakers, finishing specialists and trustworthy installation professionals can make any design or concept a functional, flawless reality. When we are awarded a project, we first partner directly with the construction management group and architect to ensure our materials and concepts align with the architectural plan through print submittals and finish samples. Once we get the architect’s approval and the appropriate materials are acquired, the project is released onto our state-of-the-art shop floor, where our artisans and fabrication specialists cut and craft every element of the custom millwork. 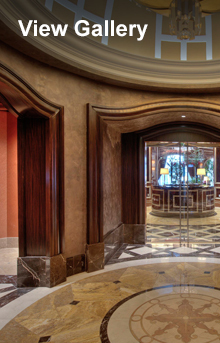 Using materials ranging from laminate to veneer, our premier craftsmen can build any architectural millwork a design calls for, from casework and cabinetry, reception desks and countertops, to custom paneling, trim and moulding. If the design calls for high levels of complexity and precision, our in-house CNC machining capabilities can handle the task. Also, our team of finishing and color artists always ensures the final product is refined and consistent. Finally, our trusted team of professional installers provides complete installation of all IWI millwork. Our involvement in every step of the project, from conception to installation, allows us to ensure that the architect’s vision not only becomes a reality, but is executed to polished perfection. High-quality veneer that is used for exposed surfaces on plywood. The decorative veneer on the face of a panel (the exposed side), be it wall paneling, furniture, cabinet, etc.